Many people live in darkness, unsure of God’s will. They believe that the heavens are closed and that people must face the world’s perils alone. Members of The Church of Jesus Christ of Latter-day Saints (often misnamed Mormons) believe that Joseph Smith was called by God to be a prophet and to restore the true gospel on the earth to prepare men for the Second Coming of Jesus Christ. A prophet is a man called by God to be his representative on earth. When a prophet speaks for God, it is as if God were speaking. A prophet is also a special witness for Christ, testifying of His divinity and teaching His gospel. A prophet teaches truth and interprets the word of God. He calls the unrighteous to repentance. He receives revelations and directions from the Lord for our benefit. He may see into the future and foretell coming events so that the world may be warned. Prophets may come from various stations in life. A prophet may be young or old, highly educated, or unschooled. He may be a farmer, a lawyer, or a teacher. Ancient prophets wore tunics and carried staffs. Modern prophets wear suits and carry briefcases. What, then, identifies a true prophet? A true prophet is always chosen by God and called through proper priesthood authority. 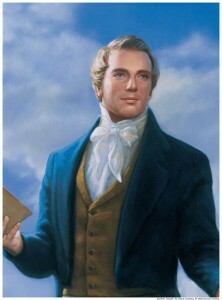 Members of the “Mormon Church” believe that Joseph Smith was called to be the first prophet of the restored Church of Jesus Christ. They currently sustain the First Presidency and the Twelve Apostles as prophets, seers, and revelators. However, when they speak of “the prophet of the Church,” they mean the President of the Church, who is President of the high priesthood.